Mott The Hoople's halcyon years, the (initially) David Bowie-inspired 1972-74 are covered in this excellent "Best Of" compilation. Unfortunately, their early period, 1969-1972, which yielded four albums of varying quality on the Island label, are not included here. The best material from that period has a separate compilations, "The Best Of The Island Years", which is also worth owning. This covers the CBS years and also has several tracks from the spin-off group "Mott", which no longer contained iconic lead singer/songwriter Ian Hunter or guitarists Mick Ralphs or Ariel Bender. Only drummer Dale Griffin, bassman Overend Watts and latter-day pianist Morgan Fisher remained. They were joined by "Spinal Tap"-esque lead singer Nigel Benjamin, complete with high-pitched squeal and a harlequin suit. Non-MTH listeners who buy this wanting to dip into the music of this great mid 70s rock band may wonder about the change in voices from track to track. 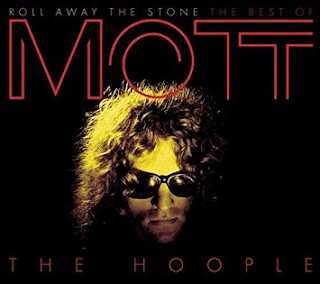 Unfortunately for this compilation, the "Mott" tracks are interspersed with the "Mott The Hoople" tracks in no clear chronological order, just a cursory nod to it. The great MTH tunes - "All The Young Dudes", "All The Way From Memphis", "Hymn For The Dudes", "Roll Away The Stone", "Honaloochie Boogie", "Ballad Of Mott The Hoople", "The Golden Age Of Rock n Roll" and the valedictory anthem "Saturday Gigs" appear here with clearly sub-standard "Mott" squawking tracks all around them. Even non MTH experts will notice the difference. The beauty of the digital age means that, digitally, one can arrange the tracks chronologically, which makes for a far better listen.Personally, at the time, I stuck with Hunter's solo material and Ralphs in Bad Company. Sorry to the lads in "Mott". I tried, I really did! Overall, though, a great compilation for those who want to get into a much-loved, honest 70s band. A benefit for long time fans is a rare appearance on CD for the highly-superior original single mix of "Roll Away The Stone" (the one that appeared on the "The Hoople" album is much worse).